Kissinger to Argentine Generals: "If there are things to be done, you should do them quickly"
Kissinger to the Argentines on Dirty War: "The Quicker You Succeed the Better"
Washington, D.C., 1 October 2004 - Secretary of State Henry Kissinger berated top aides for State Department efforts in 1976 to restrain human rights abuses by military dictators in Chile and Argentina, according to newly declassified transcripts of Mr. Kissinger's telephone calls ("telcons") posted on the Web today by the National Security Archive at George Washington University. "This is not an institution that is going to humiliate the Chileans," Kissinger told his Assistant Secretary on Latin America, William D. Rogers, on the phone, after a U.S. diplomat had publicly supported an OAS human rights report on the Pinochet regime's abuses in June 1976. "It is a bloody outrage." After learning later that month that other State Department officials had issued a demarche to the new military junta in Argentina out of concern for the growing number of political assassinations and disappearances, Kissinger called another aide and demanded to know "in what way is it compatible with my policy." The June 30, 1976, telcon records Kissinger as stating: "I want to know who did this and consider having him transferred." The Archive obtained 3200 Kissinger telcons last week through a Freedom of Information Act request to the State Department. Some 1900 additional telcons are still under review by agencies other than State. During Mr. Kissinger's tenure first as national security adviser to Presidents Nixon and Ford starting in 1969 and then as Secretary of State from 1973 through 1976, his secretaries listened in on his phone calls - unbeknownst to most of the other callers - and typed these almost verbatim transcripts. Mr. Kissinger took the telcons with him when he left office in January 1977, and the State Department only recovered copies in August 2001 after the National Security Archive initiated legal action. Earlier this year, the National Archives and Records Administration released the telcons from Kissinger's White House years, a set which NARA acquired in February 2002 also as a result of the National Security Archive's initiative. Archive analyst William Burr, whose FOIA request generated this document release, said, "I applaud the Department's publication of these documents on its FOIA Electronic Reading Room and making them available to the widest possible audience." 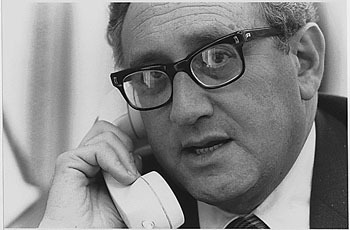 In addition to the Latin America human rights telcons, today's posting includes historic conversations such as the phone call informing Mr. Kissinger that Saigon had just surrendered in April 1975, the Soviet ambassador's commiseration on President Ford losing the 1976 election, Mr. Kissinger's call to the senior Chinese diplomat in Washington expressing condolences on the death of Chairman Mao, and Kissinger phone calls with journalists such as Time's Hugh Sidey and ABC's Ted Koppel. The declassified telephone communications on Latin America capture Secretary Kissinger's opposition to using U.S. diplomacy to denounce repression in Latin America. In preparation for a private meeting with General Augusto Pinochet in June 1976, Kissinger told Rogers "I would like to have a talk with him and…I am not on the same wavelength with you guys on this [human rights] business. I just am not eager to overthrow these guys." When Rogers protested that the issues of who governed Chile and what they did about human rights were distinct, according to the June 3 transcript, Kissinger responded: "I know but I think we are systematically undermining them." The transcripts will allow historians to listen in on some of the most extraordinary private conversations, held by the world's most powerful policy makers at pivotal moments in international history. In one dramatic conversation on April 29, 1975, a wire service reporter, Ken Fried, called Kissinger to tell him that Saigon had collapsed and announced "an unconditional surrender to the VC." Kissinger is recorded as asking: "Is it true?" The documents also record his conversation in mid-April with top aide Philip Habib on the evacuation of Phnom Penh in the face of the approaching Khmer Rouge forces. Among the documents obtained by the Archive were multiple conversations with the leading journalists of the day - muckraker Jack Anderson and conservative editor William F. Buckley. At times the conversations covered breaking news; but they also included dinner invitations, political gossip, and discussion of the 1976 election between Gerald Ford and Jimmy Carter. The Archive also posted a January 16, 1976, conversation with singer Frank Sinatra, an old friend of Kissinger's. In it, the two discuss the crisis in Angola and Kissinger jokes that the U.S. government might necessitate some of Sinatra's "enforcers"--a reference to his reputed ties to the mafia--to help, since Congress had terminated funds for CIA covert operations to support Angolan rebels. Among the 1900 telcons that the State Department has withheld pending review of other agencies are Kissinger's phone conversations with President Gerald Ford. Presumably also under review are telcons with Donald Rumsfeld, who served as Secretary of Defense during 1975-1977. While the release includes several telcons with Director of Central Intelligence William Colby, there are no records of conversations with his successor, George H.W. Bush. They may be under review at the CIA. The State Department has also withheld Kissinger's discussions with the CIA chiefs during that time period, including those with George Herbert Walker Bush, who served as director of Central Intelligence during the last year of the Ford administration. In this brief conversation, Henry Kissinger berates his aide after learning that the State Department's Latin America bureau has issued a demarche to the Argentine military junta for escalating death squad operations, disappearances and reports of torture following the coup in March 1976. The demarche was recommended by Ambassador Robert Hill and conveyed by him to Foreign Minister Guzzetti on May 27. A similar message was given to the Argentine ambassador in Washington D.C. by one of Schlaudeman's deputies, Hewson Ryan. But the demarche appears to contradict a message that Kissinger has personally given to Guzzetti during a private meeting in Santiago on June 10; to act "as quickly as possible" to repress leftist forces in Argentina. Now Kissinger demands to know "in what way is it [the demarche] compatible with my policy." He tells Schlaudeman: "I want to know who did this and consider having him transferred." As Kissinger prepared for his trip give a speech at the OAS conference in Santiago, Chile, he spoke to his assistant secretary William Rogers about whether he would privately meet with General Augusto Pinochet alone, or include a notetaker. During the conversation Kissinger makes it clear that he disagrees with efforts to pressure Pinochet to stop violating human rights, and equates such diplomacy with efforts to weaken and overthrow the military regime. "I am not on the same wavelength with you guys about this business," Kissinger tells Rogers. "I just am not eager to overthrow these guys." During his meeting with Pinochet on June 8th in Santiago, Kissinger told the Chilean dictator that "in the United States, as you know, we are sympathetic with what you are trying to do here. I think that the previous government was headed toward Communism. We wish your government well." 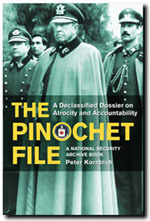 A declassified transcript of the meeting is published in full in The Pinochet File: A Declassified Dossier on Atrocity and Accountability, by Archive analyst Peter Kornbluh. 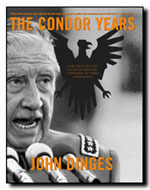 Kissinger's meeting with Pinochet, and with Argentine officials in Santiago, is also chronicled in The Condor Years by Archive advisory board member John Dinges. On June 16, following his visit to Chile, and his meeting with Pinochet, Kissinger reads an article in the Washington Post reporting on remarks made by Robert White, a member of the State Department delegation to the OAS conference. White has criticized the Pinochet regime for rejecting the OAS report on ongoing human rights abuses in Chile. Unbeknownst to White, only a few days earlier, Kissinger has privately told Pinochet that "we want to help, not undermine you." Now Kissinger is angry that a U.S. official has publicly challenged Pinochet on his human rights record. "This is not an institution that is going to humiliate the Chileans," he states. "It is a bloody outrage." Kissinger suggests to Rogers that they fire White. "Why don't we get him out?," he asks. Document 4: Telcon with Assistant Secretary of State for East Asian and Pacific Affairs Philip Habib, 11 April 1975, 9:07 a.m. Document 5: Telcon with Ken Fried, 29 April 1975, 10:31 p.m. Document 6: Telcon with Huang Zhen, Director of People's Republic of China Liaison Office, 9 September 1976, 9:45 a.m.
Having learned that Mao Zedong had just died, Kissinger called the senior Chinese diplomat in Washington to express his condolences. Though identified as an ambassador, Zhen did not have ambassadorial status because Beijing and Washington did not yet have normal diplomatic relations. They had liaison offices but not embassies. As Kissinger noted, the United States intended to "continue the policy of normalization," but the Ford administration had not achieved the diplomatic breakthrough that Kissinger and Nixon had promised in 1971-1972. Beijing insisted that diplomatic normalization required breaking formal ties with Taiwan but that was the last thing that Ford wanted to do before the 1976 presidential election. In light of his need to win the support of the strongly pro-Taiwan Reagan right in the campaign, Ford took a most cautious course on diplomatic relations with China. Document 7: Telcon with Hugh Sidey, 10 September 1976, 7:33 p.m. The next day Kissinger spoke with Time Magazine writer Hugh Sidey about a story on the Kissinger-Mao relationship that Sidey had prepared. Sidey had excellent access to Kissinger (it did not hurt that Time had named Nixon and Kissinger "Man of the Year" for 1972) and they plainly had a smooth working relationship. Here Sidey reads from the draft and Kissinger corrects it line by line. Determined to keep the U.S.-China relationship as smooth as possible, Kissinger carefully amended and weeded out language that could get him and U.S. policy in trouble with Beijing. As he advised Sidey, "The less you can ascribe to me the better off I am." Document 8: Telcon with Secretary of Agriculture Earl Butz, 16 October 1975, 12:03 p.m.
That morning started badly for Kissinger; the Washington Post published a story on remarks he had made during an official dinner in Ottawa only a few days earlier. (Note 3) He was sitting near a microphone that had been left on and the press listened to the entire dinner repartee. Aided by a tape prepared by a Canadian radio journalist, the press heard, and reported on, Kissinger's more or less unvarnished views of Richard Nixon and John F. Kennedy, among others. According to reporting in the Post and the New York Times, Kissinger said that Nixon was "one of our better presidents" but that he was also "an odd, artificial, and unpleasant man." As for Kennedy, his first two years were a "disaster" and he had "not done anything very substantial" by the time of his death. Kissinger told Butz that he was "upset" about that story but it was not the only newspaper report that bothered him. That same day the Post had also published a story, "Butz Loses Power to Set Food Policy," that discussed a shift in control over exports of food, especially grain, to Communist countries, with the State Department taking a greater role in policymaking. Butz was not too happy about the shift in authority--I'm "tired of being treated like a cross-eyed step-child"--but what particularly incensed Kissinger was a quote discussing the then-current embargo on grain sales to Poland in order to prevent Warsaw from selling the grain to the Soviets. A U.S. official was quoted as saying that "They wanted to use Poland to hold the Soviet Union's feet to the fire" as pressure to get a long-term agreement on grain exports. As Kissinger explained to Butz, any hint that the United States was trying to apply economic coercion on the Soviets "creates unbelievable resentments in Moscow." a. Telcon with Julie Eisenhower, 1 November 1975, 3:15 p.m.
b. Telcon with Tricia Nixon Cox, 4 November 1975, 4:35 p.m. The flap over the indiscretions in Ottawa did not end quickly. Kissinger had to apologize to Nixon; then he received a letter from an offended Tricia Nixon. Unfortunately for Kissinger he got the two daughters mixed up; after a rather convoluted attempt at explanation, he realized that it was Tricia, not Julie, who had written the letter. Several days later, he caught up with Tricia Nixon Cox and tried to put the best face on his remarks: "I never said any of these things in a coherent conversation." If Kissinger had been less than careful on November 1 about who had written the letter, it might have been because he was still reeling from the "Halloween Massacre" engineered by Ford's chief of staff Donald Rumsfeld. Several days earlier Kissinger had learned that President Ford had demoted him by removing him from his post as national security adviser (replacing him with his deputy Brent Scowcroft). Kissinger had adversaries on the Republican right and was becoming somewhat of a political liability to Ford, who had to think about his re-election chances. While Kissinger retained his post as Secretary of State, he had been cut down to size so it did not look like he dominated Ford's national security policy. He had considered resigning but decided that he wanted to keep his influence in government. Document 10: Telcon with Jack Anderson, 5 June 1975, 3:10 p.m. Document 11: Telcon with James Schlesinger, 5 November 1975, 5:55 p.m. Document 12: Telcon with William F. Buckley, 21 July 1975, 5:03 p.m.
Kissinger had been friendly with National Review editor William F. Buckley for some years. As is evident from this document, the two got along very well socially but the highly ideological Buckley was often uncomfortable with the direction of the more pragmatic Nixon/Kissinger diplomacy, on détente and China policy, for example. (Note 6) Here the two discuss a deferred plan for dinner, ex-Kissinger aide Morton Halperin's lawsuit against Kissinger, and the impending signing of the Helsinki treaty, and Kissinger's annoyance at conservative criticism of the Conference on Security and Cooperation in Europe. Kissinger was a little defensive because the conservatives had been criticizing the CSCE for validating the boundaries of post-World War II Europe. Kissinger makes plain his well known indifference to the CSCE: "It isn't something I'm proud of." The State Department's excisions of the comments on the well-known Halperin case against Kissinger are good examples of the abuse of the privacy exemption in processing these documents. Document 13: Telcon with Frank Sinatra, 16 January 1976, 8:09 p.m.
Integral to Kissinger's celebrity status was a close relationship with well-known personalities in the entertainment business; his friendship with Frank Sinatra, which dated back to Nixon's first term, was one element of that side of Kissinger's life. When Sinatra called the crisis over Angola was ebbing but it was on Sinatra's mind as well as Kissinger's. With the U.S. Congress barring CIA intervention in Angola, Kissinger jokingly hoped that he needed some of Sinatra's "enforcers" to straighten the situation out. Sinatra might not have appreciated the allusion to the Mafia, but he was calling for a favor. He was helping with arrangements for a dinner for a Prime Minister, probably Itzak Rabin, who would be visiting Los Angeles. Sinatra wanted Kissinger to speak at the event and the latter readily agreed; but he still wanted a "few of your people." Document 14: Telcon with Ted Koppel, 15 January 1975, 9:45 a.m. Document 15: Telcon with Jerry Bremer, 9 July 1975, 9:52 a.m. Document 16: Telcon with Ambassador Dobrynin, 3 November 1976, 4:30 p.m.
Beginning early in Nixon's first term, Kissinger had forged a close and increasingly friendly relationship with Dobrynin, the chief diplomatic representative of the Soviet adversary. Together they had established the "back channel" to Moscow, weathered crises in the Middle East and elsewhere, and privately negotiated key elements of the SALT I agreement and other elements of the U.S.-Soviet détente. In the shadow of President Ford's electoral defeat, Dobrynin called up Kissinger to express his regrets about the outcome. No doubt the Soviets were a little nervous about president-elect Jimmy Carter and would have preferred the more familiar Ford-Kissinger policy. Kissinger was touched by the call from his "Marxist friend." The last part of the conversation refers to State Department comments to the press about the emigration of Soviet Jews which Kissinger had previously told Dobrynin had been badly worded. 1. Jussi Hanhimaki, The Flawed Architect: Henry Kissinger and American Foreign Policy (New York: Oxford University Press, 2004), p. 392. 2. For events on the ground, see Larry Berman, No Peace No Honor: Nixon, Kissinger, and Betrayal in Vietnam (New York, The Free Press, 2001), pp. 266-273. 3. 'Kissinger Calls Nixon `Unpleasant,'" Washington Post, 16 October 1975. See also "Kissinger Apologizes for Overheard Words on Nixon," New York Times, 17 October 1975. 3a. See “Secretary’s Conversation with Foreign Minister Jobert,” 19 December 1973, National Archives, Record Group 59, Department of State Records, Records of Henry Kissinger, 1973-1977, box 3. 4. See Glenn Frankel, "U.S. Mulled Seizing Oil Fields In '73; British Memo Cites Notion of Sending Airborne to Mideast," Washington Post, 1 January 2004. 5. For details on the "Halloween Massacre" and the Ford-Schlesinger relationship, see Walter Isaacson, Kissinger: A Biography (New York: Simon & Schuster, 1992), p. 623, 669-67; Hanhimaki, Flawed Architect, pp. 427-433. 6. For the Buckley-Kissinger relationship, see John B. Judis, William F. Buckley, Jr., Patron Saint of the Conservatives (New York: Simon & Schuster, 1988). 8. Isaacson, Kissinger, pp. 611-621; Hanhimaki, The Flawed Architect, pp. 379-380. See also Raymond Garthoff, Détente and Confrontation, 2nd edition (Washington, D.C., Brookings Institution, 1994), pp. 506-508. 9. Isaacson, Kissinger, pp. 591, 733, 734, and 735.